You know you're a terrible blogger when you can't think what you last posted. So! We've been more or less snowed in this week (my car more, D's less) and my back is getting sore from sitting nearly 10 - 12 hours per day in my computer chair. This is one of the hazards of working from home, and then diving straight into WoW once the laptop hibernates. Note to self: purchase vehicle with 4WD before next winter. The last two weeks have been unbelievably hectic at work, and consequently I chose to do two long and fairly work-intensive projects at home, just to keep things lively. Project #1 was the Great Coaster Project. I was captivated by the Fabric Coasters group on Flickr, and wanted to make my own. What a great way to use up the fabric stash! The lady at the local quilting shop was a great help in choosing interfacing, too. We chose something which was thick enough to absorb moisture from cups but thin enough that it would lie flat. I paired them with pretty dark cerulean mugs and a few different types of tea, as presents at the family Christmas party last weekend. I'm pleased that everyone seemed to think they were a neat idea. Also for last weekend I decided to tackle Candied Oranges. I've never made them before, but the picture in this recipe was irresistible and I knew I had to give them a try for the next party. It's a two week process wherein you soak the thin-sliced oranges in supersaturated sugar syrup, then set them to dry, coat them in sugar and 60% dark chocolate, and inflict them upon the unsuspecting public. The unsuspecting public didn't seem to mind; I came home with an empty bowl and many compliments. Next year, I think I'll give blood oranges and grapefruit a try - the former will be pretty, and the latter could be an intriguing sweet and sour combination. Some liked the chocolate, and some would have preferred it without... I'll do both next time. I have a couple of shawls and a pair of gloves OTN. Every time I go outside in my new winter coat I am reminded that I really ought to get cracking on those gloves; unfortunately they are a construction which has you doing the fingers early on in the process, so I am procrastinating. I can show you the shawls, though. This one is lovely to knit, and awful to look at. It's Alpaca with a Twist Fino in the "Blue Jeans" colorway, and it is one of those colorways which looks lovely in the skein and like llama barf when knitted up. I swear there's a pattern in here somewhere! This is being knit in a very interesting yarn which I acquired from the lovely QuantumTea a few weeks ago at Knit Morning. It's 70% Milk protein, 30% Silk, feels like a dream, knits up nicely but sort of oddly, and I have no idea of how it will block. It is totally unlike wool when being knit. It doesn't "scrunch in" at all - it's much more like silk in that it mostly just stays where you put it. It definitely has some stretch, so we'll see what it grows up to be! The pattern is from Heirloom Knitting - right now it's all Cats' Paws. I'm planning on doing a full-on Shetland shawl, with this being the center and later I will bind it off, pick up the sts, do a border which is still in the Excel charting stage, and then knit on an edging. And now, I need to get out of this desk chair for awhile. It's not really cold and rainy anymore. While my peppermint tea is steeping on this cold, rainy day, I feel like I should write a blog post. All around me people are jumping into NaNoWriMo (or alternatively, NaBloPoMo) and here my blog sits: neglected. Just because Christmas is right around the corner, I've been knitting away picked up a new hobby. I'll pause while you marvel at my superb sense of timing. Needle tatting. Easier than you think! I just love this cable! I finished a BSJ for the Thursday night KAL at Hearthstone Knits. The vast majority of the knitting was done while my brother and I were driving to and from Ohio a couple of weekends ago. The yarn is Regia Hand-dye Effect, and I love the colors but I'm not crazy about the texture. It's essentially a very loosely spun single plied with a black thread, and it's coarser than I expected. I'm not at all sure how it will hold up. It goes more quickly than you think! So, I brought the next best thing: lace. 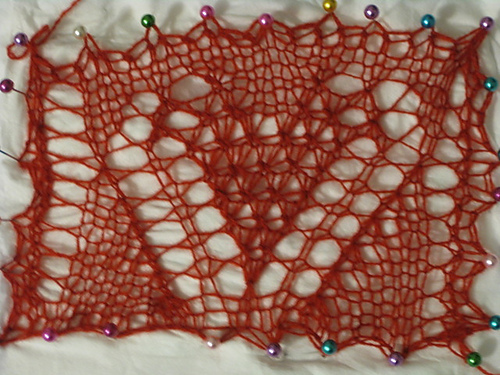 The swatch for Mystic Desire, originally a mystery KAL from Anna Dalvi. I forgot to bring the shawl upstairs for the photo-fest this morning. That's 3oz of hot pink merino, 4oz of purple and whiter merino/bamboo, 1 Abbybatt in Girly Camo which is waiting for a plying friend, and half of the huayaca alpaca from Strange Folk Fest. I wasn't really in the market for an art batt, but I did have some problematic suri alpaca - the same that I tried to spin for Tour de Fleece and failed because it categorically refused to draft. It wasn't felted, exactly, but was so compacted that it was unpleasant if not close to impossible to spin. However... A drum carder and a bit of similarly long-stapled tussah later, and I cannot WAIT to get back to it! It feels as good as it looks! We're gearing up for the new World of Warcraft expansion on Dec. 7th. I'm really loving the redesign of Stormwind (well, the melting parapets are disconcerting, but visually the city is unbelievable). The reorganization of the zones, etc, is going to take some getting used to but overall it's not the massive change that I'd feared. I'm leveling my hunter to get a feel for the new order of things. ...The only problem is: my yarn might. Bob Sheppard, the only Voice of Yankees baseball I can remember, passed away on July 11th. George Steinbrenner passed away today of a heart attack. Needless to say, this is not a good week for Yankees baseball. They both contributed so much to the team and to the sport, and will sorely be missed. RIP, boys. In happier news, I've hit the halfway mark on my Tour de Fleece spinning. I may have said earlier that it was 2oz of alpaca/merino; wrong. It's 4oz in total. The 2oz I've spun are already more than I've done in a month before (wheel spinners out there, stop laughing; I like my spindles!) and I'm happy with the singles thus far. They'll be chain plied (another new skill) as I couldn't be arsed to divide the pencil roving into 3 even piles beforehand. Lest my stash get too small (I thought I said stop laughing!) I used a Groupie credit at The Loopy Ewe to buy a lovely 4.9 oz braid of Polwarth roving in Subdued Rainbow. I'm hoping to spin it up in laceweight looooooong color repeats, either divided for 2ply or chain plied. I also picked up the yarn for the start of the knit and knag World Heritage KAL this fall, not because I have any hopes of starting on time, but because Jen the dyer has a 15% off sale running right now and I've been curious about the yarn since seeing it pop up in the Blocking thread on Rav. The yarn, lest I forget to tell you, is Nightfall from FibroFibers. My knitting doesn't have much to show for itself lately, since my attentions are entirely focused on a secret project or two, neither of which will see the glowing light of your monitors until the end of the year. Rest assured, it's not just stash acquisition going on around here. Here: have a hat. I finished it last night (and hopefully it fits the recipient. It's certainly huge on me, which is a good sign). The goal was to have the grey stripes decrease at the same rate that the blue ones increased, while still ending up with a hat of a specified height. This involved Math. Evil, evil math. I think this is Hat Mark 3. Hat Mark 3.5 if you count my first disastrous 150 stitch cast on...but I don't. Needles: US 4 for the ribbing, US 5 for the body. I still have comment logging turned on, and I sincerely apologize if my website eats your comment or decides that you are spam. I'm trying to reproduce the problem so that I actually have some legit non-spam logs to look at, and hopefully fix this once and for all! I know that I won't be able to squeeze in all of the pictures that I want, but nobody can say that I won't try! Last weekend, I drove out to Maryland to spend some time with my aunt, uncle and cousins, and oh yea -- to see some sheep!